Is there a way to send the Ctrl-Alt-Del command to an RDP session (Windows Server 2008 R2) inside another RDP session (also Windows Server 2008 R2) without the first session catching it? Ctrl+Alt+End and Ctrl+Alt+Shift+End do not reach the 2nd level session. Edit: Top-level environment is Windows 7 Enterprise. Use the On-Screen Keyboard (osk.exe). You can press Ctrl-Alt-Del virtually! I found a way to make this work. I frequently work with nested RDP sessions that go in several levels deep. That's just how I prefer to work, especially with lots of VMs. Keep in mind that my environment is primarily Windows 7 and Server 2008 R2. Here's the scenario: I RDP from Computer A to Computer B and from Computer B to Computer C.
If I try to use the On-Screen Keyboard to send Ctrl+Alt+Del on ANY of those three machines, it refers me to the Start menu, which does not help me at all. So, to send Ctrl+Alt+Del to a remote machine, simply use the OSK to send Ctrl+Alt+End from the session just before the remote machine you are trying to send it to. Works every time. 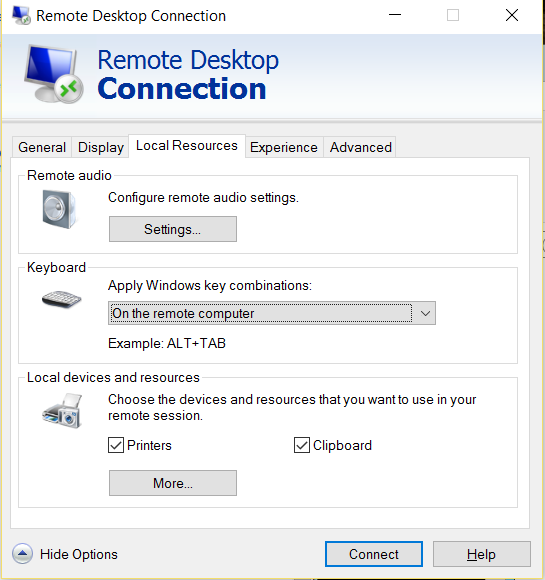 Set both RDP sessions to Send Windows keys to remote window. Now, to send Ctrl-Alt-Del to the first session, use Alt-Ctrl-Del. To send commands to the second window, use Alt-Ctrl-End. Double-click that shortcut to access the CTRL-ALT-DEL screen. There is another way you can specify where the Windows key combinations will be executed in the RDP Options Local Resources tab. In the section Keyboard you can choose On this computer, on the remote computer of Only when using the full screen. If you choose on the remote computer Ctrl Alt END will allow you to start a taskmanager in the nested rdp connection. Lifesaver if you managed to close the command Window on a core machine. I came across this solution but it didn't work for me. The OSK had been disabled and I couldn't bring it up. Found this works if you're only looking at a single nested RDP session. i.e. Session B inside Session A. Not the answer you're looking for? Browse other questions tagged windows-server-2008-r2 windows-7 rdp mstsc keyboard-shortcuts or ask your own question. Multi-monitor RDP session on an EC2 instance running Windows Server 2008 R2? How can I peer into a Windows user's RDP session for support, where I initiate the support session?